Whenever I spot long eggplants with the shiny gorgeous purple colour, I buy it and invariably end up cooking it this way! That is how much I love it! Considering that I never liked it while growing up, its interesting how I relish cooking with it now! 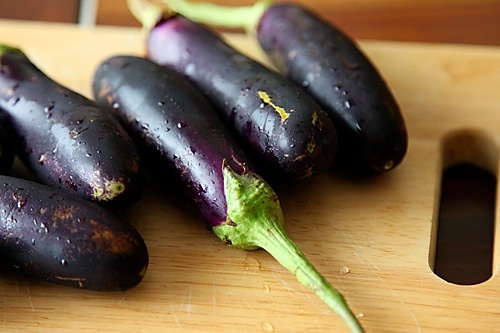 Known as eggplant in the United States, Canada & Australia, aubergine in France, Britain & much of Europe, brinjal in India and African English, this “fruit” belonging to the nightshade family of potato, tomato & bell peppers is known to be native to India & Srilanka. Salting the eggplants and then draining them off their bitter juices, a process known as "degorging" was important earlier, but you can skip this process now as the present day varieties are not as bitter as they used to be. I find that most people have a love/hate relationship with brinjals. Either you love it so much that you could eat it in any form cooked in any way or you dislike it so much that you won’t eat it at all! I also find that cooked and spiced the right way, confirmed brinjal loathers can be converted. Mostly, but like in all cases you will find exceptions to this rule too. 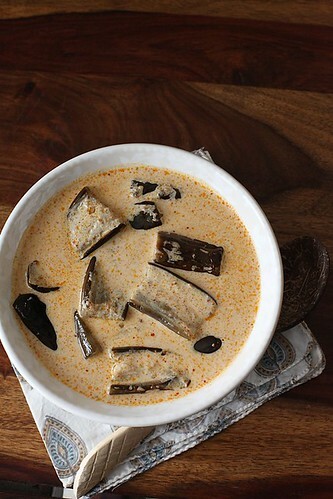 This dish is essentially Kashmiri in nature. In the book "Kashmiri Cooking", Krishna Prasad Dar explains that there are two schools of cooking in Kashmiri cuisine-"Kashmiri Pandit" and "Muslim". The basic difference between the two was that the Pandits used hing (asafetida) and curd and the Muslims used "onions and garlic". Asafetida and yogurt are the predominant parts of this preparation and I love to serve it with "Kashmiri Rajma" and "Saffron Rice". Lightly spiced and coated with it, cooked until plump and fleshy and engulfed in a creamy yogurt sauce, whether you are an eggplant hater or lover you should give this a try! Either ways, the chances are quite high that you will love it! Try and select long and slender eggplants for this dish. If you can't locate them then use any other variety of eggplants that you like. Fill a medium sized bowl with water, add 2 tsp salt to it and keep aside. Wash and cut the eggplant lengthway into two halves and then cut each half into 2” pieces. Immerse these inside the prepared bowl of water. With the help of a whisk or a spoon whip the yogurt until smooth and creamy and until there are no lumps. In a small bowl, mix all the spices the aniseed powder, hing, red chili & ginger powders together with the 3 tbsp water. Whisk with a spoon and keep aside. In a wok or kadai, heat the oil until smoking point (mustard oil is the only oil which can allowed to smoke!). Lower the heat and stir in the spice paste. Saute until the oil separates, about a minute and then put in the cut eggplants. Increase the heat a little, stir well until the spices coat the eggplant pieces, cover and cook until they are done, stirring in between to prevent scorching. This should take about 8 to 10 minutes. 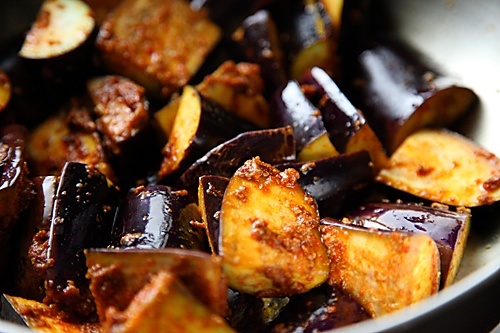 Once the eggplants are cooked, stir in the yogurt and cook on a very low flame, until just before it begins to boil, about 4 to 5 minutes. Do this carefully or else the yogurt will split. Turn off the heat, stir in the salt and serve with rice or any bread of your choice. Yum, love the gravy !!! I fall in the 'love eggplants' category! I can eat them in any form 🙂 This Kashmiri recipe sounds great! I use similar spice blend and cook cauliflower into a curry. 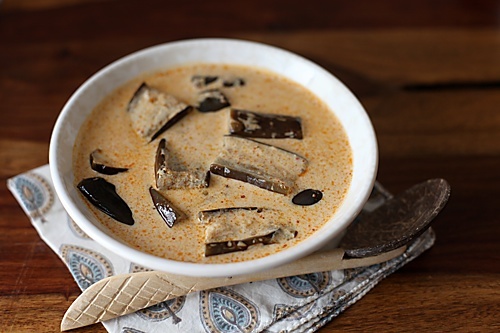 My hubby is not exactly a fan of eggplant so let me try this recipe and see if i can convert him into an eggplant lover like me! I am getting more and more obsessed with my brinjals now! They look ..oh..so yum. I'm thankfully in the 1st category – love it. And we too make it like this, just that we use 5 spice tempering. Will try with this spice mix next time!! thata a new and nice recipe for me..I am total baighan fan and bookmarked teh recipe. I'm so happy you posted this recipe. I just picked up eggplant from the farm. Now I have a great new recipe to try. Thanks! 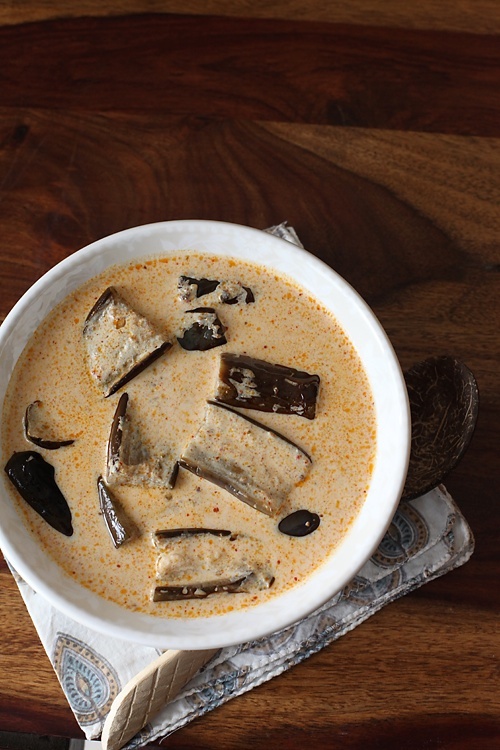 both the main ingredients used in this recipe are my fav, dahi and brinjal! fortunately, i fall into 'brinjal lover' category or i would have missed tasting this divine and versatile veg. EL: Hope you enjoy it! It would taste even better with produce straight from the farm! Sia: You will love it if you love hing…one of my favourite spices. 3/4 tsp is because there are no onions and garlic here and asafetida gives that flavour and punch to the gravy. Yes 1 tsp ginger powder. That was a typo…thanks for bringing it to my notice. Hope you enjoy it! Hi,Lovely recipe.I tried the no u gave for Rooibos, but its not available there any more,do u know any other place from where I can order it in India? Preeti: That is the only contact in India..I pick up stocks in bulk from them…wait till they get their stocks! Or you could try the waitrose brand avaiable in hypercity. Hi.. i made this last night and my husband wanted to skip dinner as he had gorged in office. But when he smelled it he just couldn't stop himself… we usually don't use mustard oil (except for stuffed karela) so this was surely a novelty for us in taste & smell. It was great and very easy & quick to make… thanx so much for the wonderful recipe. Deepali: Most people get put off by mustard oil….but you are right when cooked in a certain manner it does give a novel taste! I'm happy that you'll enjoyed this and thanks for your valuable feedback! This sounds amazing and oh-so-simple! I fall in the love category for Baingan and my husband is definitely the hate!! I doubt anything could convert him but I definitely HAVE to try it for myself this weekend! Deepak: You given interesting twists to the recipe and it doesnt really matter if it is not a Kashmiri dish anymore as far as it tastes good! This recipe is from Sanjeev Kapoor's cook book.. I had tried it with less dahi.. and it tasted awesome with poori.. I love the idea of your blog, thoughts, and recipes… 🙂 It's quite an impressive collection.. I didn't go through each and every page but I was happy to see egg-less cakes and biscuits.. I would surely try the saffron cookies and multi-grain crackers.. Thank you for the same.. Since you mentioned sattvik, would you please add any upwas recipe's? Shweta: I just looked at Sanjeev Kapoor's recipe..it uses olive oil and cardamom and the eggplants are deep fried. The use of spices like asafetida, Kashmiri chili powder, fennel, saffron and dry ginger powder is very predominant in Kashmiri cooking. This is a typical homestyle dish where other vegetables are cooked in a similiar manner in yogurt gravy. but I liked your idea of not frying.. Also, your mention of other veggies makes me want to try those frozen lotus stems.. cheers!